We now live in town across the street from a small lake. At that lake a large flock of Canadian Geese has decided to reside. I have not met a lakeside resident who likes Canadian Geese because as they forage their yards it seems they leave behind much more than they could possibly eat. I did not want them coming across the street and getting into our yard, but, ours has also been chosen as a dinner plate. One day I decided to give them a bad experience so maybe they won’t come over. They were grazing by the house so I went around the other side to cut them off from the lake. I was going to catch one of the goslings, which was about a foot tall. I gave chase with adrenalin pumping and managed to separate one from the bunch. He could not yet fly so he darted this way and that. He would have made a great running back for the Green Bay Packers, but he did not know the lineman he was up against. Finally he made a move and he was about to get past me – except I made a full body dive into the dirt with hands extended and grabbed the fleeing fowl. After a brief struggle to get a good secure hold on his full body, I had him fully subdued – I thought. Then he exploded with struggle again. Boy, that little guy was strong! But I held on and kept him in hand. My wife saw the whole episode. She said it would have gone viral if it had been taped and posted. But after a brief rest, and a short photo shoot, I let him go, hoping they learned their lesson to not get on my place. That lesson lasted about three days. I can see they have been back, and it was confirmed by my wife. For me, the expression “wild goose chase” now takes on a whole new meaning. 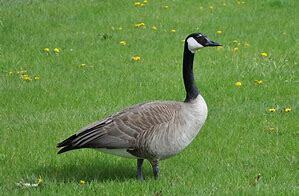 I have discovered that even if you catch the goose it does not do a whole lot of good. Jesus said blessed are those who hunger and thirst after righteousness, they shall be filled (Matthew 5:6). In other words if we really want to know and go God’s way in everything, it won’t be a wild goose chase, God will see to it that we get that heart’s desire. With our heart turned to Jesus Christ to receive his gift of life and his claim of Lordship, God will fight for us and undertake for us in ways far beyond what we can imagine. Faith comes to God believing that he is and that he is a rewarder of those who diligently seek him (Hebrews 11:6). Our religion might be empty, but real faith in God is no wild goose chase. God will meet with and fill the heart that is truly hungry and thirsty for him.